While diamonds are the most popular gems for wedding and engagement jewelry, engagement rings featuring a birthstone are increasing in popularity for women who desire a more unique ring layered with sentiment. There are many ways to use birthstones to imbue an engagement ring with special meaning, and the ring will be even more treasured because it is unique to the couple. What Is a Pre-Engagement Ring? Diamond Encrusted Swiss Blue Topaz Ring: This eye-catching ring features an intense blue center stone accented by sparkling diamonds on all parts of the band. Princess Cut Peridot and Diamond Ring: This simple ring is done with a princess cut center stone and is done in a classic channel set band with diamonds. Amethyst and Micro Pave Diamond Ring: This stunning ring has a large center cushion cut stone surrounded by micro pave diamonds. Adele Ring: This engagement ring is set in white gold and features a round cut aquamarine surrounded by a halo of small, white diamonds. Rosemary Ring: This is a round rhodolite garnet set in 14K yellow gold and accented with side diamonds. Natalie Ring: This ring feature a round Citrine set in 14K white gold and accented with a halo of diamonds and white sapphires. Emerald Three-Stone Ring with Diamonds: Set in platinum, this ring has an emerald center and two baguette diamonds on each side. Sapphire and Diamond Ring: This ring is set in 14K white gold and is done in a classic three-stone style. Our Custom Wedding Rings feature Infinity Birthstone Engagement Rings. These rings feature the bride's birthstone as the primary gemstone and the groom's birthstone as the accent. Jewelr.com has semi-customizable couple's rings that feature two birthstones, diamond accents, and engraved names of the couple. These are avalable in several styles, including four stone rings and interlocking hearts, with your choice of birthstone and engraving. Rings can be purchased in 14K white, rose, or yellow gold or sterling silver. Synthetic and genuine stone options are available. The easiest choice for birthstone rings is to use the bride's birthstone. This can be done in two ways: using the birthstone as an alternative center stone instead of a traditional diamond, or using small accent birthstones in addition to a diamond. When using a large birthstone gem, be sure to investigate the characteristics of a quality stone, including typical flaws and appropriate coloration. For small accent stones, the quality is less vital because the central diamond will be the ring's focal point. The accent stones can be different gems or arranged in a symmetrical pattern around a central diamond. The entire design of the ring can be focused on the two birthstones, such as a heart or infinity shaped band that encloses both birthstones. The ring can simply just feature two stones - one for the bride and the other for the groom. Not only are dual birth month rings unique and interesting, but because they use symbolism for both the man and woman, they are doubly significant and show the bond the couple shares through that engagement ring. 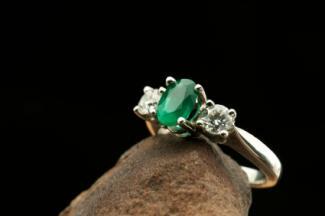 Another option for an engagement ring featuring a birthstone is to simply find one at a jewelry store. 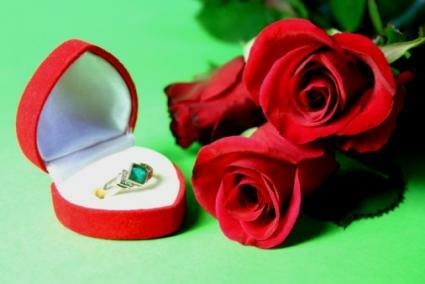 You both may like a certain color or stone and decide that it will be your engagement ring. This option gives you the ability to purchase what is in stock and can often result in a great deal. You may also decide to use an heirloom birthstone ring as your engagement ring. Maybe the ring has been in your family and passed down through the generations. Birthstone rings can potentially cost far less than traditional diamond rings, because many birthstones are semi-precious gems, which typically have a lower value since they are less rare. You may find that it is necessary to customize birth month engagement rings, however, because many jewelry stores only stock a limited selection of birthstone jewelry, especially outside the month in question. When creating a custom piece, you can create an even more meaningful ring using the bithstones of your choice, such as the important dates or dual his-and-hers birthstones, or any other design incorporating the birthstone that you wish. Every bride-to-be enjoys showing off her engagement ring, and a birthstone ring is even more fun to display because she can explain the additional significance of the gems. That sentimental value is worth far more than a few colored jewels, and will be treasured for many birthdays and anniversaries to come.